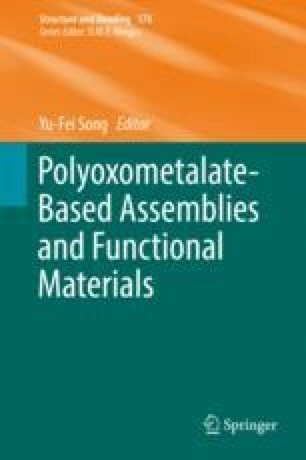 The properties of porous ionic crystals based on polyoxometalate (POM) anions, which are different from conventional porous crystalline materials such as zeolites and metal-organic frameworks (MOFs), can be summarized as follows: (a) POMs show reversible redox properties, which can lead to the formation of “redox-active” porous ionic crystals. (b) Specific functions such as guest binding and catalytically active sites can be incorporated beforehand into the ionic components, and these functions can be maintained and utilized after complexation of the ionic components since they still exist as discrete molecules in the crystal lattice. (c) The ionic components create strong electrostatic fields at internal surfaces, which are suitable for accommodation and stabilization of polar guests and cationic intermediates. (d) Since Coulomb interaction works isotropically in a long range, the crystal structures are often flexible and can transform to adapt to specific guests. Crystal structures of porous ionic crystals can be controlled by the appropriate choice of elements, charges, sizes, symmetry, or ligands of the ionic components. These properties and control of structural features lead to interesting functions in gas adsorption/separation, ion-exchange and conduction, heterogeneous catalysis, reduction-induced highly selective ion uptake, etc., which are unique to porous ionic crystals. This work was supported by JST-PRESTO Grant Number JPMJPR1312 and Grant-in-Aids for Scientific Research from the Ministry of Education, Culture, Science, Sports, and Technology of Japan.